After being linked to this Huffpo article a few days ago, I decided to check out the book that its examples were drawn from. 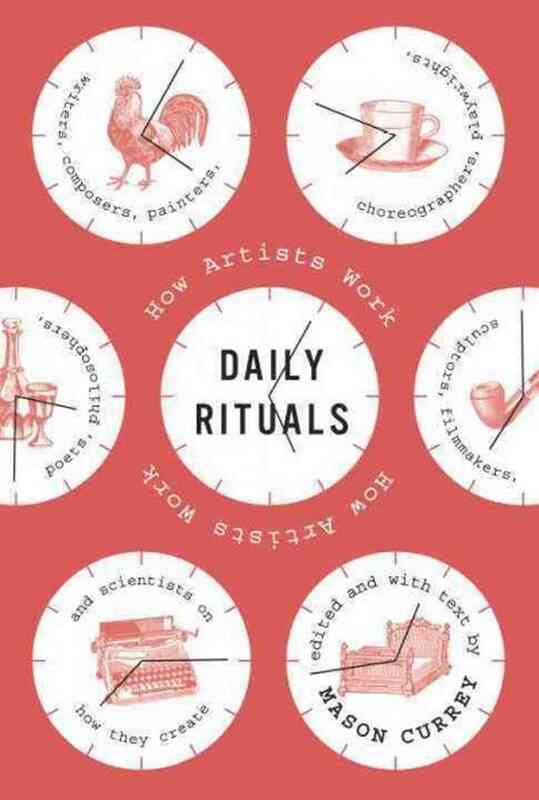 Daily Rituals is filled with short (1-3 page) descriptions of how various writers live(d) and work(ed). And it is phenomenal. First of all, it’s full of insane anecdotes, like how Patricia Highsmith was such a misanthrope that she’d bring her pet snails to parties with her so she could be entertained whenever she got bored with the guests. Or how Kierkegaard would literally fill a cup full of sugar and then pour coffee over it and drink the resulting concoction (which actually sounds pretty amazing). Or how Proust (supposedly) lived on a single croissant per day (sometimes two). But, more importantly, you also get a sense of exactly how and how much these writers and artists worked. The extremely orderly: these people kept to rigid schedules that they followed every single day. They also tended to be somewhat reclusive (which makes sense, since a rigid schedule doesn’t really allow for the interruptions caused by a social life). Examples here include Simone de Beauvoir, Kant, Benjamin Franklin, Proust, Flaubert, Juan Miró, and Philip Roth. The 2-3 hour a day folks: These are people who were content to do just two or three hours a day (and, usually, they believed it was counterproductive to do more than this). Examples here include: Anthony Trollope, Henry James, Martin Amis, Thomas Mann, Richard Strauss, Henry Miller, and Graham Greene. The hopelessly disorderly: people who write according to no fixed schedule (and often suffer months where they produce little or nothing). Here I also include people whose writing habits are incredibly bizarre and idiosyncratic (Gertrude Stein, for instance, would drive out into the country and look for a cow, because she liked to look at cows while she wrote. Then she’d sit on a rock and maybe get half an hour of writing done before she was tapped out for the day). Examples are: Jane Austen, Frederic Chopin, Gertrude Stein, F. Scott Fitzgerald, Ann Beattie, and Tom Stoppard. (Personally, I fit into the third category, though I wouldn’t say it’s impossible that I might someday fall into the second). My schedule is absolutely my own. Usually, I write all day, but if I want to go back to the studio in the evening, after dinner, I don’t have to sit in the living room because someone else has been alone all day. I don’t have to sit there and be entertaining or amusing. For me, it’s also nice to know that a person can have a very successful literary career and produce exceptionally good work even if they only write for 2-3 hours a day. Personally, I spent years hovering around 1.5 hours per day, and I’ve only recently managed to work myself up to 3 hours per day, so I’m not sure I’m ever going to be a person who sits down for 7 hours a day. Second of all, it’s interesting to see how reclusive some writers are. Personally, I found myself admiring some of these secluded lifestyles. It would be nice to be in some tiny place in the middle of nowhere and not even be able to distract myself with (or make myself anxious about) interactions with other people. It would be lonely, but I think it’d be very interesting to be alone with my work for such an extended period of time. I had a taste of that over the winter break, when I was writing the first draft of my crime novel, and it was a very powerful experience.